With the year coming to a close it is always a good idea to take an inventory of the good and the bad in one’s life. There may be things that are holding you back from being the best that you can be, such as drugs and/or alcohol. It is easy to fool oneself into thinking that your drinking habits are in line with your peers, and therefore–not a problem. It is dangerous to base whether or not you have a problem from what you see your peers doing, not everyone is the same and what one perceives is not necessarily fact. If you are unsure about the nature of your relationship with alcohol, you may find it useful to do a little research to see if you meet the criteria for being a problem drinker. If it turns out that your relationship with alcohol is unhealthy and a change is needed, do not be discouraged—you are not alone. In fact, almost 70% of adults in the United States consume alcoholic beverages and close to a third of those individuals engage in risky drinking over the course of their life, according to research from the Centers for Disease Control and Prevention (CDC) and the Substance Abuse and Mental Health Service Administration (SAMHSA). In the rooms of recovery, we know first-hand where risky drinking can lead. 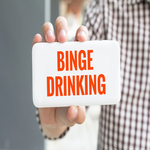 What starts out as “binge drinking” on the weekends, can eventually morph into a full-blown alcohol use disorder (AUD). Around 10 percent of adults who engage in binge drinking have an AUD. If you are a binge drinker and feel that your use of alcohol is impacting your life in negative ways, please contact Hope by The Sea.